A courtroom sketch from November 2018 shows Cesar Sayoc, who pleaded guilty in New York on Thursday to sending bombs to media figures and to critics of President Trump. Cesar Altieri Sayoc, 57, was arrested in late October and was scheduled to go on trial in July on charges related to using weapons of mass destruction and transporting explosives. None of the devices exploded. He has been held without bail since his arrest. "I knew these actions were wrong. I'm extremely sorry," Sayoc said, as quoted by The Washington Post. He told U.S. District Judge Jed S. Rakoff that he did not intend for the devices to explode but was aware of the risk that they might. Sayoc faces a possible life sentence in prison and is scheduled for sentencing on Sept. 12 on 65 criminal counts, according to a statement by the U.S. attorney for the Southern District of New York. 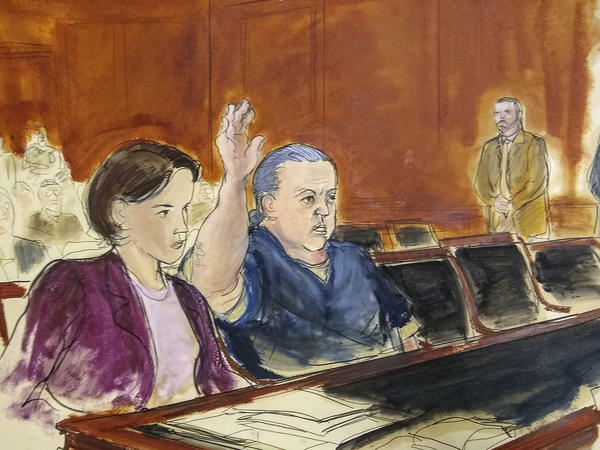 "For five days in October 2018, Cesar Sayoc rained terror across the country, sending high-ranking officials and former elected leaders explosive packages through the mail," U.S. Attorney Geoffrey S. Berman said in the statement. "Thankfully no one was hurt by these dangerous devices, but his actions left an air of fear and divisiveness in their wake. Sayoc has taken responsibility for his crimes, and will soon be sentenced to significant time in prison." Sayoc mailed 16 improvised explosive devices to 13 targets around the United States, including 11 current or former U.S. government officials, the U.S attorney's statement says. "In alphabetical order, SAYOC's intended victims were former Vice President Joseph Biden, Senator Cory Booker, former CIA Director John Brennan, former Director of National Intelligence James Clapper, former Secretary of State Hillary Clinton, CNN, Robert De Niro, Senator Kamala Harris, former Attorney General Eric Holder, former President Barack Obama, George Soros, Thomas Steyer, and Representative Maxine Waters. Between October 22 and November 2, 2018, the FBI and the U.S. Postal Service recovered all of the 16 IEDs mailed by SAYOC." A former DJ and bouncer at strip clubs, Sayoc had a criminal history. "Prior to the arrest, the registered Republican was living in a van plastered with pro-Trump and anti-Democrat stickers. One image showed the president standing on a tank with a rifle, complete with United States flag and fireworks," reported NPR's Sasha Ingber. An earlier version of this story incorrectly said Cesar Sayoc is 56. In fact, he's 57.